In 2018 Hub Culture launched 'Hub Culture Expeditions' - an initiative to bring together members of the community for once-in-a-lifetime adventures built on meaningful connections. For the first edition, a small group travelled to the Winter Olympics in Pyeongchang, South Korea, with access to special events, a Hub Ski Lodge location and a range of concierge services. 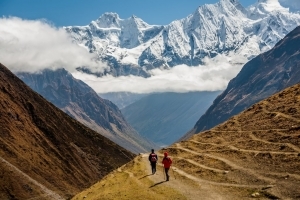 For the 2019 Expedition, Hub Culture is parterning with Conscious Impact to build a 10 day adventure in the mountains of Nepal. The initiative offers an impact component with work to assist villages damaged in recent earthquakes and an outdoor mountain and nature component, to explore the tremendous Himalayas that make Nepal the roof of the world. So why Conscious Impact? Like Hub Culture, Conscious Impact believes that real change takes time, and this means building in-depth relationships and trust within communities. As initial steps, they have created their first “Camp” (local headquarters) based in Takure, Nepal and have begun to foster dialogue, trust, respect and understanding with communities affected by the recent earthquakes. Conscious Impact then started inviting international volunteers from all backgrounds to join their Camp to offer skilled or unskilled labor to the local community - the goal is to inspire, mobilize and train volunteers to serve others with compassion. Currently, Conscious Impact is partnered with just one community, however their hope is to grow their impact to support numerous communities around the world, and increase their volunteer capacity across the country. This 10-day expedition begins in Kathmandu and includes a 6 night stay at various mountain locations, a 4 day mountain trek and volunteer work. Dates are 13th - 22nd April 2019. Group vehicle transfers to and from events included. Interested in joining? Contact us. Reserve your participation. Learn more about Consious Impact.